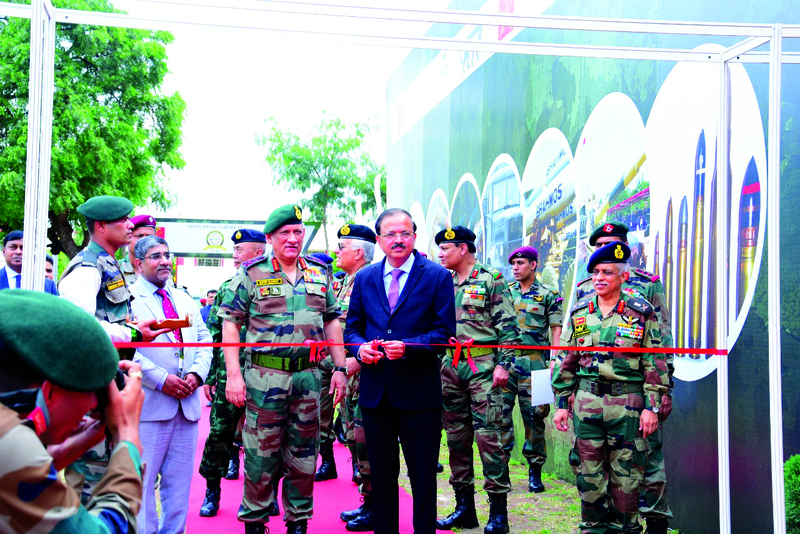 Minister of State for Defence, Dr. Subhash Bhamre inaugurated the first ever Equipment Display by key Indian defence players to the BIMSTEC Nation Armies on September 16, 2018 at Pune. 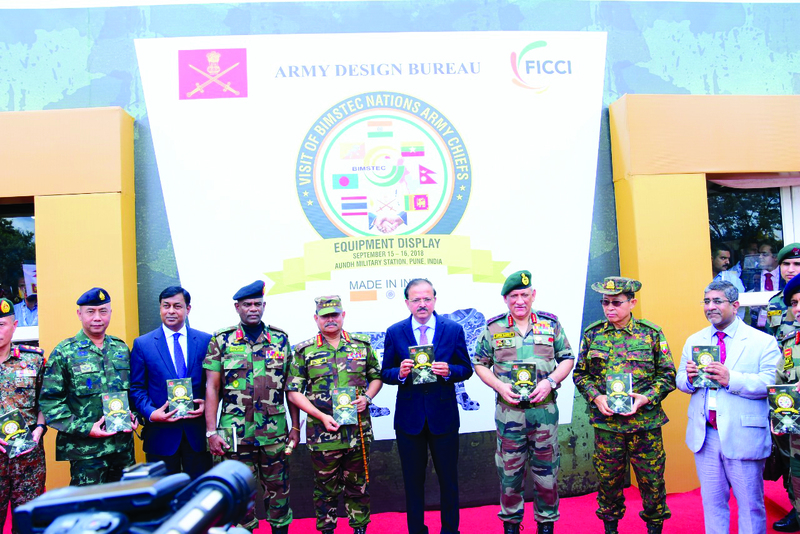 The equipment display was organised by the Federation of Indian Chamber of Commerce and Industry (FICCI) in association with the Indian Army on September 15 16, 2018 at Pune, concurrent to BIMSTEC MILEX (Military Exercise). Dr. Subhash Bhamre, Raksha Rajya Mantri along with General Bipin Rawat UYSM, AVSM, YSM, SM, VSM, ADC, Chief of Army Staff, India inaugurating the FICCI Indian Army: Equipment Display by Key Indian defence players to BIMSTEC Nations's Army Chiefs and accompanying contingents held at Aundh Military Station, Pune. On this occasion Dr. Bhamre also unveiled the 'Equipment Display Catalogue' which captured the details of nearly 250+ product exhibits covering Small Arms and Munitions, Surveillance Equipment, Communication and Radars, Body Protection Armour Solutions, Protected and Heavy Vehicles, Mobility Solutions, Simulators etc. that could be offered to the BIMSTEC Nation armies. The equipment displays which opened on 15th September was visited by the army contingents from Bangladesh, Sri Lanka, Thailand, Myanmar, Bhutan, Nepal and senior officers from Indian Army Headquarters, New Delhi and Southern Army Command, Pune. While the equipment display enabled the system integrators to promote their export capability, it also gave business visitors from tier 2 and tier 3 industries to understand the systems being offered by System Integrators and be a part of their supply chain. “The visits by senior army officers and the decision makers from BIMSTEC Nations to the equipment display has opened up new avenues of export opportunities for the Indian defence majors. FICCI will continue to play its role as a facilitator to develop indigenous defence capability and promote our defence exports,” said Mr Vivek Pandit, Assistant Secretary General, FICCI. Indian defence Players who pitched their offerings to the BIMSTEM Nations included Larsen & Toubro, Zen Technologies, Tata Motors, Bharat Forge, DRDO, Ordnance Factory Board, Bharat Electronics, BEML, Tata Aerospace and Defence, Ashok Leyland, Alpha Design Technologies, Punj Lloyd, MKU, SM Group, Precision Electronics, ideaForge and Clensta Technologies (partnered by IIT Delhi).